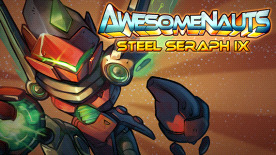 This DLC contains a custom skin for Ix the Interloper in Awesomenauts, and comes with a fully customized voice set! If you have not unlocked the character yet, purchasing this content will do so. Steel Seraph Ix has unique voicelines when encountering robotic or demonic opponents.